A Beam Central Vacuum System thoroughly cleans any floor surface and virtually anything above the floor. A Beam system is more effective at removing dirt and allergens because it has a larger, more powerful motor than an upright – up to five times more powerful. Particles are completely removed from living areas and carried to a canister in the garage or basement for a cleaner home, and healthier lives. A Beam Central Vacuum System uses tubing installed in the walls of your home to carry dirt, dust and allergens away from living areas to a collection canister in the garage or basement. To activate the system, simply plug in the lightweight 30' hose into the nearest Beam wall inlet. (The average home has three inlets.) Then attach your choice of cleaning tools and you're ready to go. The flexible 30' hose lets you move from room to room for fast, easy whole-house cleaning convenience. It's quiet, too, because the power unit is in the garage. One of the side effects of our efforts to conserve energy has been a deterioration of the air quality inside our homes. In fact, the Environmental Protection Agency (EPA) estimates indoor air pollution levels may be as much as five times greater than outdoor levels. Approximately 50 million people, one of every six Americans, suffer from allergies and as many as 26 million Americans suffer from asthma. And most allergy victims are allergic to indoor allergens such as dust, dust mites and pet dander. 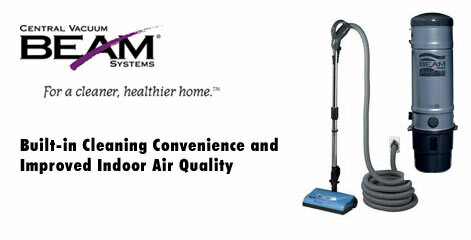 Clinical research proves a Beam® Central Vacuum System provides relief for allergy sufferers! Indoor air pollution is one of the most common problems addressed by allergists and is troublesome for their patients. Central vacuum systems often are recommended for removing pollutants. Researchers at the University of California at Davis set out to determine whether a central vacuum system can relieve allergy symptoms. Unlike conventional vacuums that can recirculate dust, a Beam system removes 100% of contacted dust, mites, pollen, animal dander and other allergens, and is superior to a conventional vacuum in providing relief from allergy symptoms. Study results were published in an article entitled "The Influence of a Central Vacuum System on Quality of Life in Patients with House Dust-Associated Allergic Rhinitis", which appeared in the Journal of Investigational Allergology and Clinical Immunology*. The study was conducted under the auspices of Stanley M. Naguwa, M.D., and M. Eric Gershwin, M.D., both of the Division of Rheumatology, Allergy and Clinical Immunology, University of California at Davis School of Medicine, Davis, CA, USA. UC-Davis clinical research proves a Beam system reduces allergy symptoms. Nasal Symptoms: Patients who used central vacuum systems rated the severity of stuffy/blocked nose, runny nose, sneezing and postnasal drip 47 percent less than the baseline and 49 percent less than when they used a traditional vacuum. Non-Nasal/Eye Symptoms: Patients who used central vacuum systems rated the severity of fatigue, thirst, reduced productivity, tiredness, poor concentration, headache or feelings of being worn out 48 percent less than the baseline and 46 percent less than when they used a traditional vacuum. Eye Symptoms: Patients who used central vacuum systems rated the severity of itchy, watery, sore and swollen eyes 61 percent less than the baseline and 60 percent less than when they used a traditional vacuum. Sleep Symptoms: Patients who used central vacuum systems rated the severity of sleep symptoms including difficulty getting to sleep, waking up at night and lack of a good night's sleep 44 percent less than the baseline and 49 percent less than when they used a traditional vacuum.